Victoria Johnson is an associate professor of Urban Policy and Planning at Hunter College of the City University of New York. Her biography of the botanist and doctor David Hosack—the attending physician at the Hamilton-Burr duel—will be published in June 2018 by Liveright, a division of W. W. Norton & Co. It is titled American Eden: David Hosack, Botany, and Medicine in the Garden of the Early Republic. Hamilton Grange National Memorial with newly planted American Sweetgum. Alexander Hamilton considered himself a poor gardener. 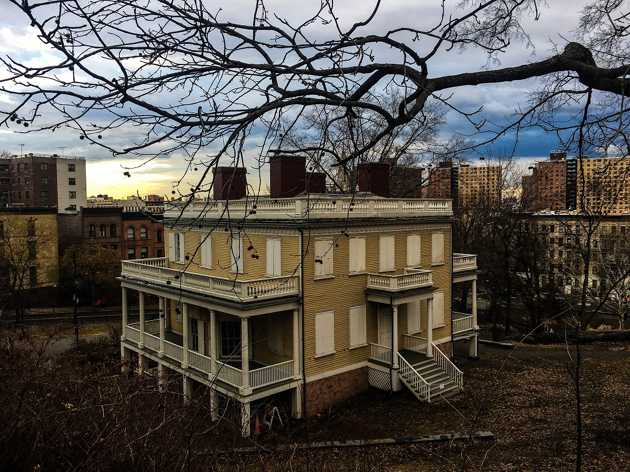 When Hamilton wrote these words, he was facing an entirely novel challenge: laying out the grounds of his new country house in northern Manhattan. The Grange, as he called it, was a boxy yellow mansion on a parcel of about 35 acres he had purchased in 1800. From its piazzas, Alexander and Eliza could catch glimpses of the Hudson, East, and Harlem Rivers. Hamilton had spent most of his life immersed in the pleasures of words. Now, as he worked on what he described as his “sweet project,” he began learning about the pleasures of plants. Sometimes when he was riding from his townhouse in lower Manhattan up to the Grange, he stopped by the botanical garden that had been founded a few years earlier by his friend David Hosack, the Hamiltons’ family physician. Hosack had studied medicine, botany, and horticulture in Britain in the 1790s, and at his 20-acre garden (today the site of Rockefeller Center), he was assembling a vast collection of medicinal, agricultural, and ornamental species. When Hamilton visited the botanical garden, Hosack gave him bulbs, plant cuttings, seeds, and horticultural tips for the Grange. Hamilton’s Thirteen Trees, anonymous article from the Illustrated American, April 23, 1892. National Park Service Manhattan Historic Sites Archive. I first became interested in Hamilton’s horticultural work at the Grange while researching my forthcoming book about David Hosack and his botanical garden. Through this research—some of which I conducted at The New York Botanical Garden’s LuEsther T. Mertz Library and in the collections of NYBG’s William and Lynda Steere Herbarium—I met Daniel Atha, Director of Conservation Outreach at NYBG and one of the lead researchers of the New York City EcoFlora, a project to map all the plant species in New York City with the help of New Yorkers themselves. Every month, the EcoFlora team selects a species for interested New Yorkers to look for. January’s EcoQuest species was American Sweetgum, so Daniel invited me to join him on a quest to figure out where Hamilton’s original 13 Sweetgums had stood—and to take observations of the Sweetgums currently surrounding the Grange. Joining us was our friend Markley Boyer, who created the sumptuous digital imagery for the 2009 book Mannahatta: A Natural History of New York City, by landscape ecologist Eric Sanderson. We were equipped for our adventure with copies of old photographs and maps. The Grange originally stood at what is now Convent Avenue and West 143rd Street. 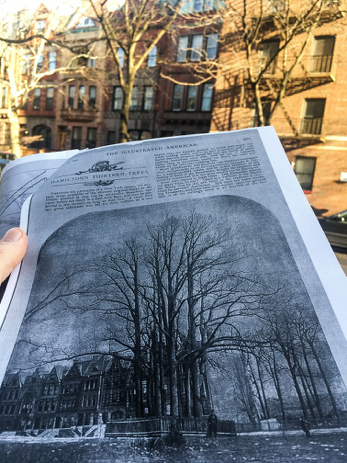 We saw that the townhouses visible in one old photograph of the trees are still standing, and this helped us pinpoint where Hamilton had planted his Sweetgums. 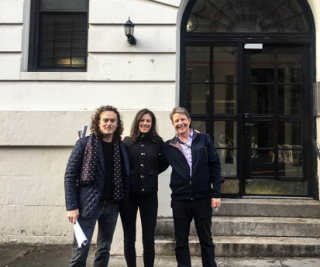 Left to right: Markley Boyer, Victoria Johnson, and Daniel Atha at the former site of Hamilton’s 13 Sweetgums. It seems that Hamilton was right about one thing—he was a horticultural novice. His Sweetgums matured into an uncomfortably crowded clump. Sweetgums are a canopy tree, so they are happiest with space to stretch out their upper branches. As Daniel explained to me, Sweetgums are, in fact, one of two co-dominant canopy trees in the natural areas of New York City (the other being black cherry, Prunus serotina). Sweetgums love moist areas like swampy lowlands and forested areas watered by underground springs. Hamilton’s Sweetgums stood on a higher piece of land than they naturally prefer, but at least some of his trees lived for an entire century. For that reason, it seems likely that they were near a source of water such as a spring. Hamilton’s 13 trees were famous long after his death. When the last trees were dying and the new owner of the property threatened to cut them down, the New York State Legislature passed a bill to buy the land and save them. They died anyway, and an apartment building was built on the site where they had stood. By this point, the Grange itself had already been moved across Convent Avenue and out of harm’s way by the congregation of St. Luke’s Episcopal Church. There the Grange stayed until 2008, when it was moved to a more spacious site in St. Nicholas Park at 141st Street and Hamilton Terrace. The National Park Service, which runs the Grange as a memorial to Hamilton, undertook a painstaking restoration of the house. They planted new Sweetgums in the yard, which Daniel documented for the January EcoQuest. 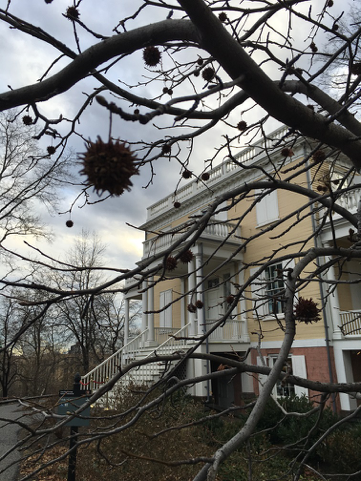 He also recorded data on a majestic old Sweetgum that had been growing in the park before the Grange was moved there, perhaps from seed blown from nearby trees. We don’t know for sure, but we can at least dream that it might be a descendant of one of Hamilton’s original Sweetgums. Hamilton, as it turned out, never got to see his 13 trees grow to maturity. On July 11, 1804, he was shot by Aaron Burr on a wooded ledge across the Hudson, and he died the next day despite Hosack’s desperate efforts to save him. Although Hamilton’s trees eventually perished, too, it is lovely to see that Sweetgums thrive all around the Grange today—as they do throughout New York City’s remaining forested spots. Hamilton Grange National Memorial with large American Sweetgum. Prof. Johnson will be at the Garden to speak about her biography of David Hosack on Friday, June 22, beginning at 3 p.m. in Ross Hall. Her talk, the keynote address of the annual meeting of the Council on Botanical and Horticultural Libraries, will be open to the public. Check nybg.org for details.